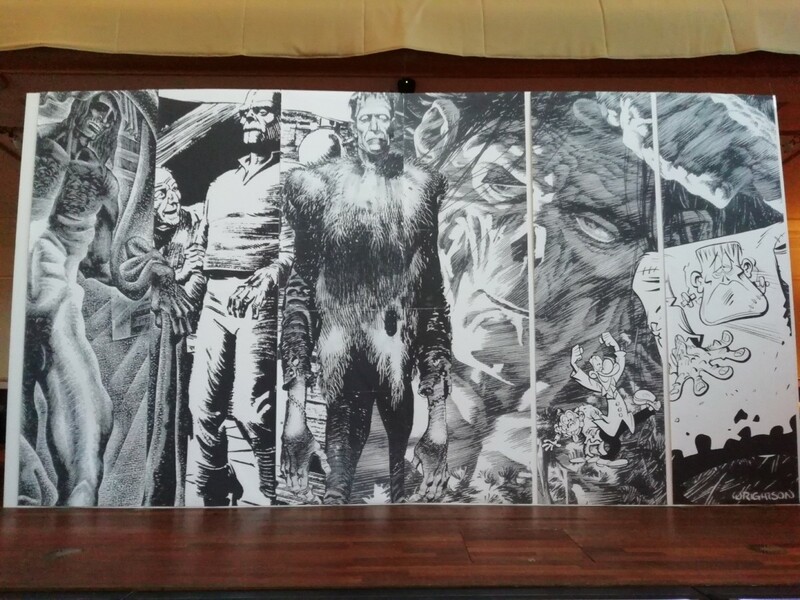 This article the second out of two parts about comic books and their conservation written by Eliane Gomes for iBookBinding. Here Eliane describes different techniques that may cause damage to comic books. Some attention is given to the matters of storage as well. To find the first chapter please click here. The results can be disastrous when you decide to skip the advice from professionals and follow only D.I.Y. videos on YouTube on how to restore your comics. There are some terrible practices present, which I think are the main source for the distrust from the comics community towards restoration work. 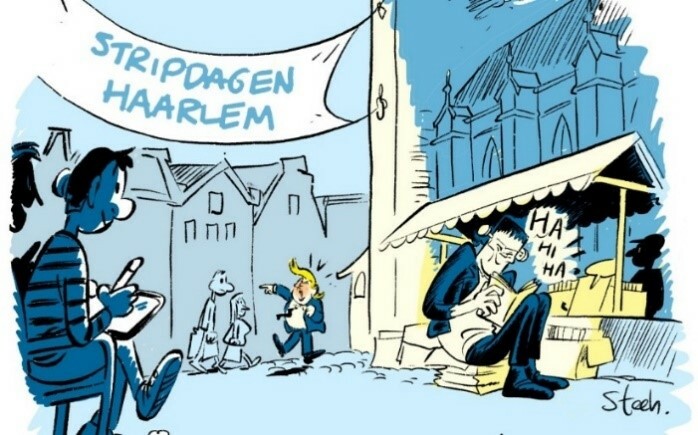 Through my contact with the Dutch comics’ community and web research, a couple of such practices called my attention. Let me tell you about some of them. The technique of bleaching or lightening the pages is used to remove stains and give the book a crisp new look. Unfortunately, people doing this do not consider the damaging effects on the paper fibers. Chemical bleaching will make paper cellulose fibers fragile. It accelerates auto-destruction mode for certain kinds of paper. The light bleaching technique used by art conservators requires expertise to get it right. It is a less invasive technique, but only applicable to sorts of paper that have no lignin. 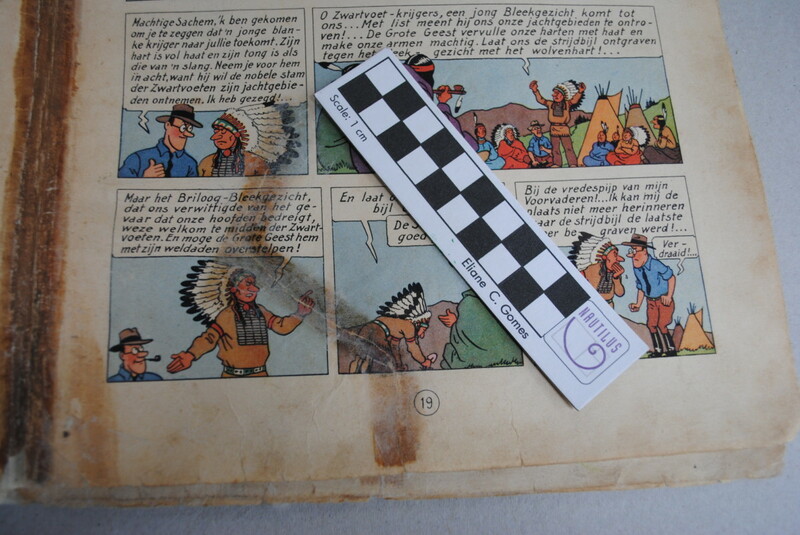 Most of the paper used in comics contains lignin1, hence the yellowing and acidification. That’s when they try to match pieces of a “cadaver,” which is some incomplete comic, to fix missing parts of a comic in a better state. This category also includes “married covers,” that’s when a damaged cover of a book with a good block is replaced with a good cover taken from some books with a damaged book block. I find this practice dubious, and it can be perceived as cheating the client. This practice goes against the conservators and restorers work ethics. That’s another practice that can both devaluate your comic book for the trading industry and result in some raised eyebrows among the members of the conservation community. You know you stroke bad when you see that felt point marker touching up the color of some part of the book. In-painting2 should not be done directly on the object, but on an archival quality carrier. Like Japanese mulberry paper, which should be placed on top of the damaged area with the use of a reversible glue. Also, a conservator will not try to make it totally invisible. The procedure should be reversible and made using only the top of scale products. Comics pressing is a treatment offered by certain companies. This technique uses a dry mounting press to apply pressure and heat combined to minimize creases on the cover and improve the commercial value. The application requires experience with the technique, as correct temperature and exposure time are essential factors. Aesthetically speaking this method is very appealing for collectors and traders. I don’t see many issues in applying it, but I have some question marks about the treatment not being mentioned in the grading report. Grading companies do not consider it as a restoration/conservation intervention, which in my opinion it is! The method is not to be confused with the pressing technique used in book conservation. Here pressing will often involve some humidification depending on the condition and quality of the paper: from a bath to a humidification chamber. Moreover, pressing usually involves special non-woven acid-free materials forming a blotter-sandwich. This layered cake rests under weight or in a press, until dry. Quick tear repairs that involve usage of adhesive tape, duct tape or some other even more creative types of tape can leave their marks forever. There are no archival tapes, as well. Forget them all! Did you know: the longer you leave the adhesive tape on paper, more difficult is it to remove it? These tapes are pressure sensitive and time only strengthens the bond. The adhesive (glue) penetrates the fibers, reacts, and leaves nasty stains which are very difficult if not impossible to revert. Once the “carrier” (plastic part) is removed, lots of gooey chemicals and stains are left to deal with. Sounds like a terrible marriage, isn’t it? The use of plastic sleeves called safe-vinyl is also a wrong solution. Safe vinyl (PVC) does not exist. It is highly reactive and will destroy your collectibles. If you decide to use plastic make sure it is inert plastic like polyester (PET, Melinex® or Mylar®), polyethylene (PE) or polypropylene (PP). Also, avoid airtight solutions, they are not ideal in most cases. Lorraine Finch posted the photo on her Facebook account and said: “This is what happens when C20th paper is kept in the damp – just for a short time! It shows the importance of keeping your comics in good storage”. 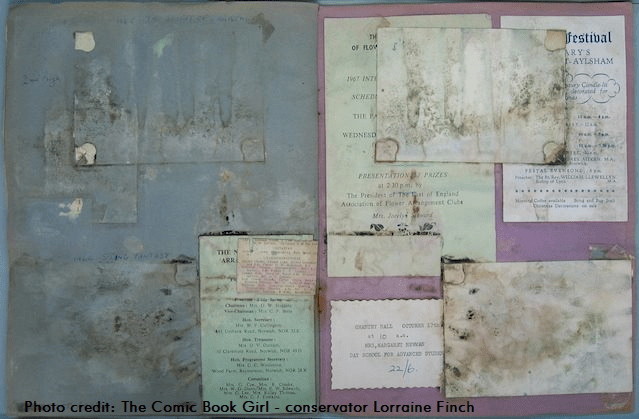 The conservator and comic books’ lover Lorraine Finch launched a campaign called “Unplastify!”3 for the sake of your collectibles! Her YouTube short video is listed under references. Acrylic holders used by graders fall into this category as well. Graded comics generally come inside of a transparent acrylic holder, which after grading is sealed, and a grading label is attached. Holders should protect comic books from outer destructive agents and, once sealed, guarantee that the material inside is the one graded. I wonder if they ever considered the effects of sealing an object and creating a microenvironment, as paper deterioration will not stop inside. During big fairs and events, I often see traders carrying their stock in big “cardboard moving boxes.” They are affordable and sturdy, but not acid-free. For that function, I suggest the use of polypropylene transparent archival boxes. 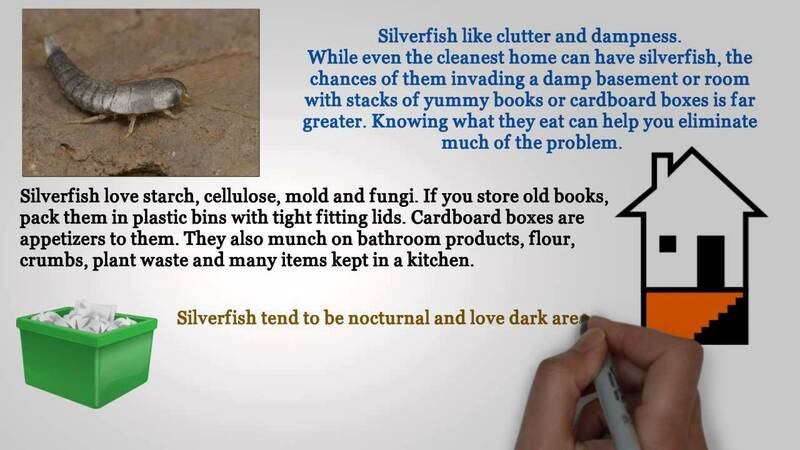 And don’t forget that silverfish LOVES cardboard. Once an infestation sets, the insects will add your comics to their diet. These little bugs can cause a lot of damage to any collection. I have been working with comic books’ restoration for some years. My clients are mainly private collectors, and they want their book to be in good condition. Preserved for the next generation. Many of them want to have the ability to reread their books, not only to display or trade them. They are well aware of the object’s value and choose to avoid allowing certain damages to progress. Once I have the project, it receives the same attention, ethical approach, and consideration I give any other book. I often encounter low-quality paper, plenty of stains, evidence of usage of adhesive tapes of all kinds. The book structure may be compromised, many tears and other damage suggest that the book went through many adventures. Despite that, I always ask this question: are you doing it for yourself or you plan to sell the book later? It is crucial to discuss and explain the scope of work to the client beforehand. I find сomic books’ paper from before the 1980’s a bit easier to mend. 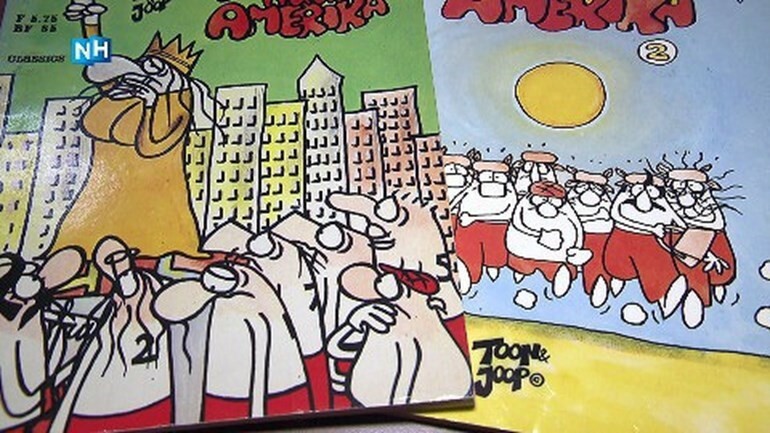 After that moment, publishers started using paper coating that makes pages shiny. And it is hell to deal with them. I sometimes pass on projects simply because they are out of my reach of expertise. In such cases, I do not hesitate to contact a more experienced colleague to carry on the task. Sometimes even from a different area of expertise. Client’s satisfaction is a crucial point. These days most of the publishers and artists do not always choose paper for its archival qualities. 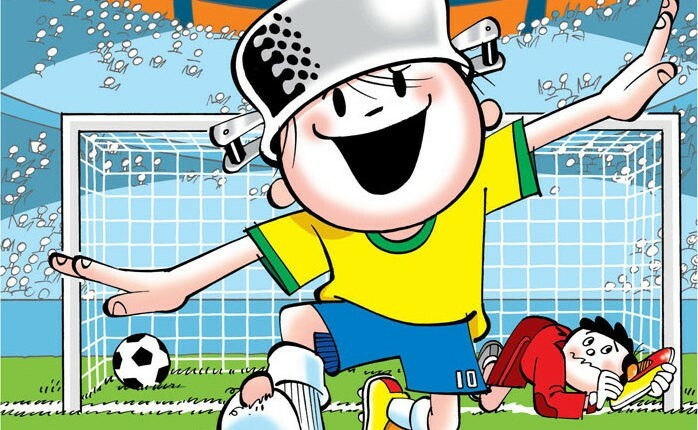 Materials for comics are purely chosen to better show the graphic effects desired. Value engineering is an intrinsic part of the trade. Some of them are comfortable with its ephemera status, literally speaking. Do I read the comics when they are in my atelier for restoration? Of course, I do! I love comic books!